If you’re feeling a bit down in the dumps, we’ve got the solution. This list focuses only on positive, inspirational, and amusing stories from the last few days which ensure that you won’t end the week on a sour note. Click here if you also want to read up on the weird happenings in the world. This week, we talk about two truly awesome space stories and two archaeological discoveries that got scientists giddy with excitement. There are also a few endearing animal tales that involve a drunk pigeon, a clumsy bear, and a cat in pajamas. The US embassy in Canberra accidentally sent out an e-mail invitation using a photo of a cat wearing Cookie Monster pajamas. The image displayed a tabby wearing furry, blue pajamas and holding a plate of cookies. It had the title “cat pyjama-jam.” The e-mail was sent out by the US Department of State and was simply titled “meeting.” Besides the funny invite, it also contained some text written in Latin and an RSVP tab for recipients. US Mission to Australia public affairs counselor Gavin Sundwall apologized for the mistake. He attributed it to “training error” from new staff testing out the e-mail newsletter platform. He also said sorry to everyone disappointed that they would not be able to attend a “cat pyjama-jam.” There was no mention of how many people received the e-mail. Chow has been in the movie industry for over four decades, having appeared in over 120 films. He first rose to prominence in several hard-boiled action flicks by John Woo and garnered recognition in the West for movies such as Crouching Tiger, Hidden Dragon and Pirates of the Caribbean: At World’s End. During that time, Chow amassed a fortune totaling $5.6 billion HKD, or approximately $714 million in US dollars. According to Chinese entertainment site Jayne Stars, Chow lives an extremely frugal lifestyle and spends only $800 HKD ($102 USD) per month. Examples of his thriftiness include shopping at discount clothing stores, taking public transport whenever possible, and using the same Nokia phone for 17 years. As far as his free time is concerned, Chow prefers healthy (and cheap) hobbies like jogging and hiking. It was a happy ending for Buckethead the bear as it was reunited with its mother after three days of wandering around with its head trapped in a plastic jar. A few days ago, a black bear cub weighing around 45 kilograms (100 lb) was spotted in the forests of Maryland. It was alone, roaming around with a large plastic container on its head. It was clearly in distress and unable to remove the receptacle. Rangers from Maryland’s Wildlife & Heritage Service tracked the cub they nicknamed “Buckethead” for three days before finally catching up to it right as the animal reached a festival in McHenry. The bear was tranquilized, and the jar was safely removed in front of a crowd of cheering onlookers. Afterward, the cub made its way to the woods, where it reunited with its mother and its sibling. A young boy with leukemia has started his own group called Team BAM!, which has delivered thousands of toys to other children hospitalized with medical conditions. Although he is only nine years old, Ben Manzi has been fighting a leukemia diagnosis since he was six. Therefore, he is well aware of how depressing time spent in the hospital can be. He thought he could make other kids feel better by giving them toys as rewards for dealing with the hard times. To that end, Ben and his mom started Team BAM!, an organization focused on raising funds to help kids battle cancer and to support research into childhood leukemia. At the same time, Ben’s mom, Kati Otero, believes that it is important to help others in need just like they were helped by their local community. This was the third toy drive for Team BAM!, and it was its biggest yet. The group donated over 1,000 toys, games, and books to the Baystate Children’s Hospital in Springfield, Massachusetts. Archaeologists from the Norwegian Institute for Cultural Heritage Research (NIKU) used ground-penetrating radar to uncover one of the largest Viking ships ever discovered. The vessel is almost 20 meters (65 ft) long, and scans show it to be in unusually good condition. Given its size, scholars believe it once belonged to an important chieftain. If it hasn’t been looted, it might even hold a treasure trove of artifacts. Even so, there are no current plans for excavations, but rather to continue noninvasive investigations and map out the site. Researchers aren’t sure how old the ship is, although the surrounding Jelle Mound has been dated back 1,500 years. It is possible that another mound once sat atop the vessel and was plowed away. Otherwise, archaeologists aren’t sure how a ship of this size remained undetected on farmland continuously plowed for centuries when it was buried just half a meter (1.6 ft) beneath topsoil. New Zealand has voted on the 2018 bird of the year. The distinction goes to the kereru, a wood pigeon with a reputation of being the drunkest bird in the country. Also known as the New Zealand pigeon, the kereru can be found in plentiful numbers on both North and South Island, both in cities and in the country. Most notably, it has a fondness for fermented fruit. This has landed the bird in numerous predicaments where it was too inebriated to fly straight or to sit in a tree. 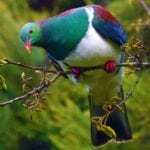 Particularly during summer, when there are copious amounts of fruit available, wildlife rescue centers in New Zealand often take in kereru that have fallen out of trees or flown into windows. Forest & Bird, the conservation group in charge of the contest, described the animal as “clumsy, drunk, gluttonous, and glamorous.” It seems those are the qualities that appeal to New Zealanders, as the kereru won the competition by a wide margin. It garnered over 5,800 votes, while second place, the kakapo, collected fewer than 3,800 votes. In a world first, astronomers from the University of Cambridge were puzzled, yet intrigued, to discover four massive, Jupiter-like planets orbiting a very young star. The star is called CI Tau and is located approximately 500 light-years away from us. At two million years old, it is just a baby on an astronomical scale. It still has a protoplanetary disc, which is a circumstellar disc of ice and dust which should provide the raw materials needed for rocky planets to form. Yet it already has four gas giants orbiting it, raising questions that no current planet formation model can answer. Furthermore, CI Tau’s planets also have the most extreme range of orbits ever observed. The innermost planet is roughly as close as Mercury is to our Sun, but the outermost world has an orbit over three times greater than that of Neptune. It will be hard to tell if CI Tau is an exceptional anomaly for a hot Jupiter system or simply our first glimpse at a new standard model. While hot Jupiters are easy to spot, the same cannot be said for their sibling planets. In this case, the other worlds were detected because they left gaps in the protoplanetary disc. Older stars, however, no longer have the disc, so this method would not work on them. “What the heck is this thing,” were the words uttered by Italian archaeologist Giovanni Carboni back in 2006, when he unearthed a weird ceramic bowl at a dig in a Roman suburb. Twelve years later, he believes he has solved the enigma—the object is the oldest musical instrument in Rome. The ceramic artifact resembles half a giant walnut shell with the rim perforated evenly with holes. It has been dated to 3000 BC and was found in a tomb, placed next to the body of an adult male. It came from the Gaudo Culture, a Neolithic society that primarily settled in the region of Campania in Southern Italy. The uniqueness of the find made it more appealing but also made it more difficult to identify its purpose. However, two similar objects were found at later digs near Naples and have been discerned as sound boxes for primitive instruments. Archaeology student Martina Cerri studied the mysterious object for her thesis and came up with two hypothetical replicas based on the technology, materials, and culture from 5,000 years ago. One of them resembled a lyre, while the other was a bowed lute. She even recruited a few musically inclined students, who performed a prehistoric concert at the Museum of Origins at Sapienza University. The RCMP was called to Upper Tantallon, Nova Scotia, when a person noticed two suspicious women trespassing in his neighbor’s house. A police investigation revealed that the women entered the home, cleaned it, and left. As it turned out, it was a simple mix-up. The two ladies were cleaners hired to work on a house in the neighborhood. They were expecting to find an empty residence with an unlocked door, but they got the address wrong. As it happened, the homeowner was also out of town and left their door unlocked so that their neighbor could walk their dog. Therefore, the two women went inside armed with a mop and a vacuum cleaner and got to work. They left the place looking spick-and-span, never realizing that they were in the wrong house. A neighbor saw them and called the homeowner, who alerted the police. It’s unclear if any charges will be filed. The RCMP reminded the public that, even though in this case the house was cleaned for free, people should lock their doors at all times. Scientists announced the discovery of the largest and earliest known proto-supercluster in the universe. It is called Hyperion and was formed roughly two billion years after the big bang. Its mass is over one million billion times that of the Sun. A supercluster is a grouping of galaxies and galaxy clusters. Our Milky Way is part of a galaxy group simply called the Local Group, which, in turn, is part of the Laniakea Supercluster. Hyperion was detected in the constellation Sextans using the Visible Multi Object Spectrograph (ViMOS) installed at the Very Large Telescope (VLT) in Chile. The supercluster was spotted thanks to its redshift, which is the measure of how much an object’s light has stretched out toward the red end of the spectrum as it moves away from us. According to the paper’s lead author, Olga Cucciati from the National Institute for Astrophysics (INAF) in Bologna, it wasn’t just the size of Hyperion that surprised astronomers but also its location. These kinds of giant structures are typically found at lower redshifts, as the process required to form them is extremely lengthy. Scientists aren’t complaining, though, as studying Hyperion gives them a unique look into the history of superclusters.